Egg dying is actually very simple, except for creating new and innovative designs for your eggs. There are a few supplies that you will need to dye eggs. First, make sure that there is adult supervision when dying eggs. Children can have a wonderful time dying eggs independently, but it can be messy and certain parts of the process require supervision. You will also need the supplies for actually dying the eggs. You have probably seen all of the egg dying kits in stores leading up to the Easter holiday. These kits make egg dying very simple since all of the items you need for egg dying. However, you don't have to purchase an egg dying kit, in fact, you probably have most of the items in your kitchen already. If you decide to dye your eggs on your own you will need: food coloring, white vinegar, water, mugs that you can place an egg in, newspaper, hard boiled eggs and egg cartons. The one item found in the kits that is very helpful and difficult to find elsewhere are the egg holders, which makes lifting the eggs out of the dye without touching them much easier. After hard boiling the eggs, allow them to cool. As your eggs are cooling start getting the egg dyes together. One of the best ways to make dye at home is to pour hot water into a large coffee mug. Into eat mug place a few drops of food coloring into the hot water, the secret ingredient to making amazing egg dye is to add a few drops of white vinegar to the dye. The vinegar adhere the color to the egg shell, so they come out looking more vibrant and the colors last longer. You can mix and match colors to create new and unique colors, or you can stick with the usual colors, red, yellow, green and blue. Once the dyes are ready, the fun starts. You can dye the eggs completely one color, or you can create patterns and other creative dying techniques. Egg dying is a really fun way to celebrate spring in a truly creative way. 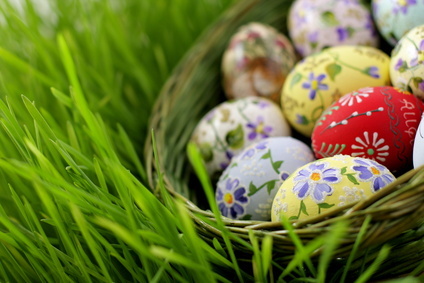 Then when all of the eggs are dyed and dry, you can enjoy a fun egg hunt. Another fabulous spring and easter craft is creating Easter bonnets. The Easter bonnet is a long standing Easter traditions, and you can add your unique style to the tradition by creating your own bonnet. Easter bonnets can range from simple paper plate bonnets to decorating straw hats. Creating an Easter bonnet really allows you to be as innovative and creative as you want, so don't limit yourself to these ideas. You should use this craft as a way to think outside the box and be as creative as possible. If you have a straw hat around that you don't mind turning into an Easter bonnet, you can use this as the base for your new bonnet. All you have to do is use spring themed items to decorate your with. You can hot glue silk flowers to the top of the hat and tie long silk ribbons around the brim. If you want to go wild you can use sequins and beads and more to make a sparkly addition to your bonnet. If you don't have a straw hat or want to create your whole bonnet yourself. You can use a paper plate as the base for your bonnet. One method you can use is as follows. Place your paper plate upside-down on a table. Color or paint this visible part of plate however you think will look best. Now you cut three slits across the plate from end to end, leaving about an inch of either end uncut. Crimp the silt pieces upward. Now its time to decorate your hat. You can use ilk flowers or you can use craft appear or tissue patter to create your own flowers. You can also use ribbons and more to create your perfect Easter bonnet. Spring time is a great time to enjoy spending time with friends and family. The weather starts warming up, flowers start blooming, and holidays like Easter allow us to break out our inner creativity. You can get together with your friends and family to enjoy a day or evening of bonnet creation and egg dying.